Bright colors blended flawlessly into stunning patterns can turn the simplest room into an elegant paradise. Incorporating floor tiles with wall tiles is easier if you know some tricks for integrating the two. 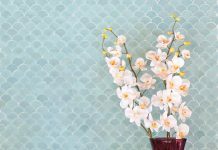 There’s no reason to shy away from pairing floor tiles with wall tiles, as a few tips from top designers will make you an expert in no time. One of the easiest ways to incorporate wall and floor tiles into your bathroom or kitchen is to look for a right balance in size. This is emphasized by Sarah Sherman Samuel who suggests creating balance with one small scale pattern and one large scale pattern. Doing floor-to-ceiling subway tiles will make the room feel claustrophobic, but a mix of bold, bright floor tiles in a single color mixed with a much smaller pattern climbing the walls will transform a room. Here is a beautiful example of how designer Ken Koonce, using St. Tropez cement tile design created perfect balance using this idea. 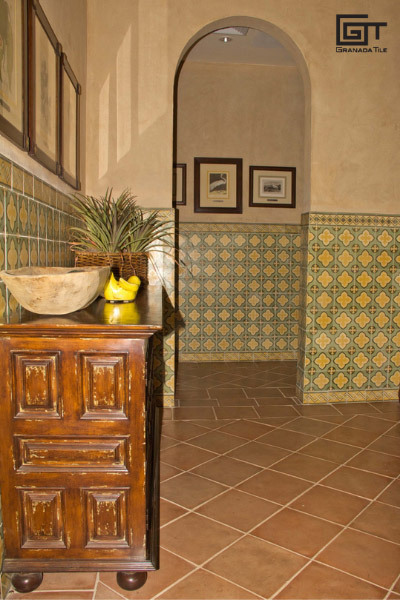 The traditional way to scale tiles is to have a larger tile on the floor, with smaller designs on the wall. We have seen designers flip the norm lately with a small hexagon or unique shape on the floor and large plate tiles covering the walls too. Designers have used this trick for years. 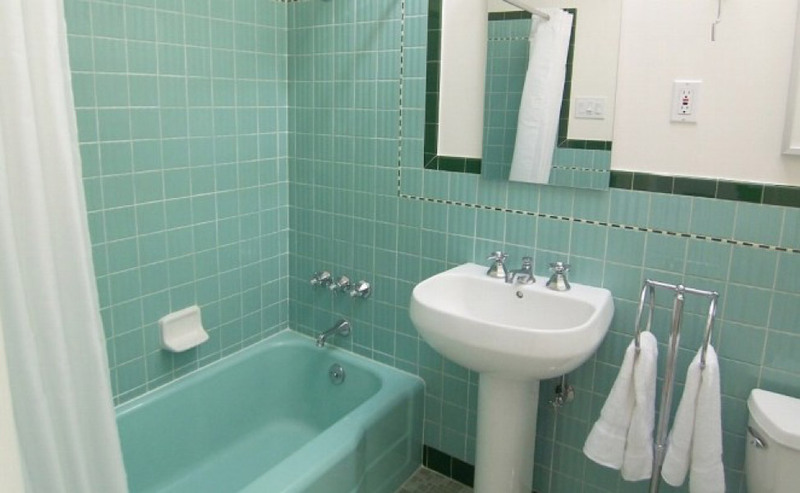 If you remember the popular look of the 1940’s, 50’s and 60’s with tiles coating most of the entire bathroom, you instinctually know patterns work well when they’re used once in a single space. In this photo, you’ll see a floor to ceiling solid tile with only a thin decorative liner. 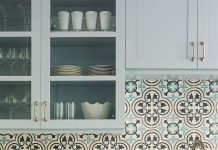 Tile choices don’t need to be subtle, as unique patterns can showcase your personality in the home, but they do need to be chosen intentionally. It helps to only use one pattern in a room, on the floor and in a glass-enclosed shower, to keep the look feeling fresh without being overwhelming. Here is an update to that popular look that is both fresh and modern. 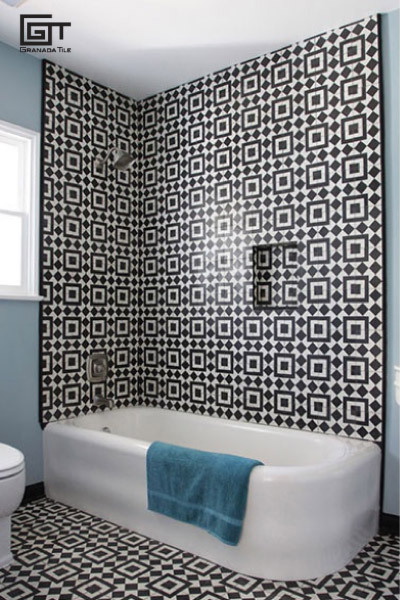 Edward Solis chose Granada Tile company’s Fez design in a bold black-and-white combination. The rising trend of earth-toned colors in bathrooms and kitchens have us excited. Warmer tones, (such as one of our 2019 top picks, rust), can transform a space. Spa-inspired bathrooms get a facelift with a tile from our Olvera Collection, blending seamlessly into neutral floors. Choosing colors from the warm and comforting palate of earth tones can turn you into a tile pairing expert. Channel the old-world experts and consider doing large, simple tile in a neutral color and choosing a pop of pattern on the wall. By having the floor neutral your options for patterned walls are limitless. The look will last for years and years. This bathroom was designed for a resort hotel at Rancho Santana by Altevers International. If you’re looking to break out, why not break the rules while you are at it. Design experts at Bestor Architecture show how, with some expertise and a bit of flare, the one-pattern rule can be thrown out for a dramatic masterpiece. Why does it work? Here are two fabulous patterns that have complimentary colors which combine to create a look that is memorable in this sleek and ultra-modern bathroom (featuring two of Granada Tile’s sensational cement tiles: Santander stripes on the floor and Maldon playful triangles on the shower wall). Regardless of what type of look that you admire from afar in designer magazines, you can bring it into your own home with a clever application of tile. With so many options to choose from, we feel our selection of concrete tile will leave you breathless. Give us a call today at 213-788-4238 to turn your dream into a reality!